This is my answer to topic: ”where were you at 80’s”. I was born when Urho Kekkonen was still Finlands president which makes me feel so old (he was the president 1956-1982). At the end of his term he came down with dementia and was eventully very sick. His follower was Mauno Koivisto. The 80’s was the time when children still played outside and played board games too cause computers was so new and was not so usual (specially in early 80’s). Girls played with Barbie dolls too which was a totally own world (we didn’t have a virtual world like sims or something like that). Also people still wrote letters and posted cards for the same reason. I too had a lot of pen pals (specially in 90’s). I loved to get (long) letters and write those too. No one did have cell phones eather. We only had one landline at home. The biggest thing I still lively remember from the 80’s is the Chernobyl disaster (1986) even I hadn’t quite turned 6 years by then. I still remember how mom talked of it to dad even I didn’t understand how serious it was. 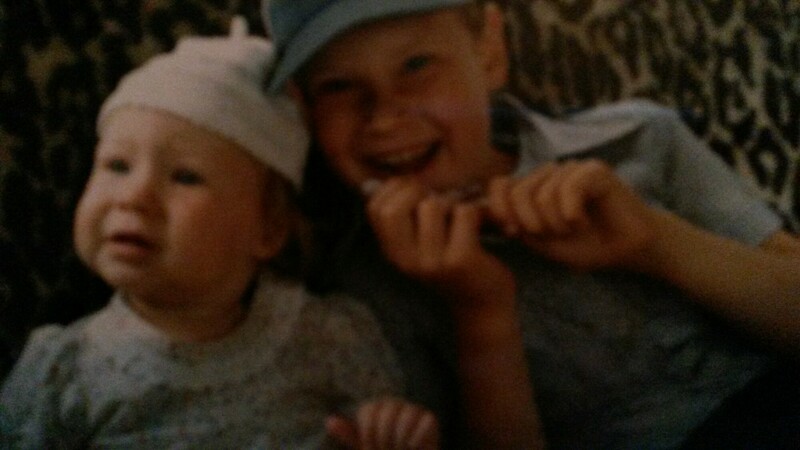 Me and my brother at summer cottage. 80: I was born at Helsinki ”Naisten klinikka” (= women clinic). 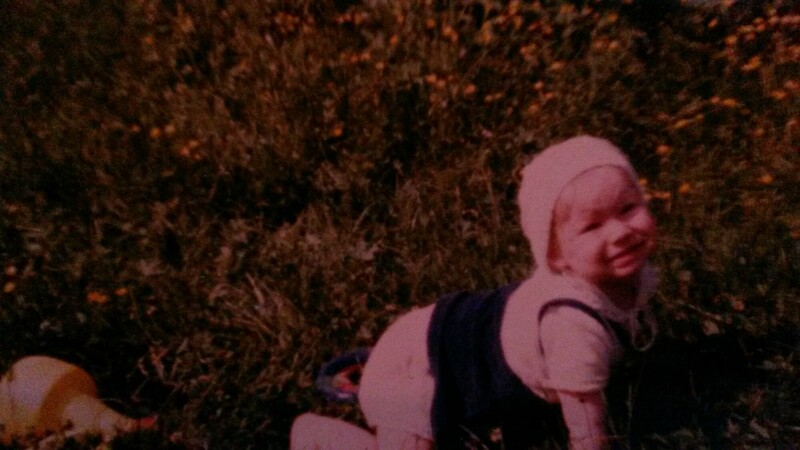 81: I took my first steps. 82-84: I was first time at boat trip (to Stockholm) and I was scared of ball pool where I went with my big brother. I was so little and I felt like I almost drowned in it. My brother took me eventully away from there. 84-85: I wounded my hand when I was playing with my brother and my godparents daughter. They did casting me (several times) on the bed. Other them had my legs and other them where holding my hands. It’s was nice until I broke my hand. I ended up in hospital to surgery. I eate my first burger at ”Carrols”, which was quite new place in Finland. 85: I went to children’s day club and made new friends. 86: I went to preschool and met new friend: Katariina who became my best frend. I did ”awake” to world. I understood I’m part of it and became awareness. (Watch my post of it.) https://tanssitytto.wordpress.com/2016/09/29/the-first-awakening/. 87: I went to primary school and also I started art school. 88-89: I went to ”nature club”. 89: I went first time to church weekend camp to a place called: ”Sipuli” (= onion). I loved that place and went there many times after that. I also crushed at first time to my friend (but ofcourse never told him). My favorite tv-series: ”Ruusun aika” (rosies time), ”MacGyver”. My favorite foods: liver casserole, macaroni casserole, thickened chicken soup. It’s me with my new hat. Go to check out my post (link under) where is also video links which reminds me of my childhood. Today we were celebrateing in Finland equality and Minna Canth (1844-1897) who was social policymaker, journalist, business woman and writer. She did fight for womens equality and she was pioneer of finnish-speaking education. Canth was also the first remarkable finnish-speaking playwright and prosaist after Aleksis Kivi and first finnish-speaking journalist woman. In Kuopio Minna got her own salon: Minna’s salong where were visiting many writers and cultural policymakers. Canth published then plays, seven novelles, storys, articles and speaks. She did represent realism and did examine in her work faults of society. ”Työmiehen vaimo” (Workmans woman 1885) is the most well known and the most radical Minna’s work where the main character Johanna have married man who drink and lures his ex-beloved. In this work Minna is criticising alcohol and mens dominance in marriage. Also ”Köyhää kansaa” (Poor people 1886) is very social story. It’s a story of poor family which father have lost his job. This work is considering social inequality and wealthy people selfishnes. ”Hanna” (1886) is awakening educational and moral questions. Hanna is young girl who is interested of studying but her parents doesn’t think it’s suitable for girl. Also her beloved cheat her. Hanna is young girls development story which have not happy ending. ”Kovan onnen lapsia” (Hapless children 1888) is work when Canth’s fanaticism did come to the top. It attacs against the class-society so badly that the theatre shows ended after premiere. ”Sylvi”(1893) is about unhappy marriage. Married Sylvi falls in love with other man and want to divorce but her man don’t give it to her. Sylvi will poison her man but after that her beloved doesn’t want her anymore and Sylvi will end up to prison. This work seem to be criticising marriages absoluteness. ”Anna Liisa” (1895) is handeling murder of child and adaption of that. It brings up the dostojevsk thought that the recognition is adaption to the wrong act. Canth wandered at poor people and prisons to get to know their life style. So she had real touch of that kind of life and she drawed her storys based of what she saw and heared. Canth handeled realistic and hard topics and have awaken with those lot of questions of the statement of society. This way she did clear the way to new thinking and made Finland better place to live over the years -also for us- women. It’s largely her income that things with women are come to this far. We are luckily almost as equal as men these days. One thing what still would need a change is wage level which is unequal and we also still have some domestic violence (being focused at women) but I think it’s mostly because of alcohol. That we should learn to use with temperance. Generally women in Finland anyway have things quite good and I’m very greatful for that! Thank you, Minna Canth for your great work! The first and original sketch character winner 2010: ”Marja Tyrni” (Aku Hirviniemi). She’s the mother of all ”Putous” sketch characters. Marja Tyrni is old widow who lives in Turku, Pallivaha and likes ”bakeing”. She admires finnish actor: Tommi Korpela. (I think) she got influenced of finnish dance teacher and entertainer: Aira Samulin. Slogan: ”Suut makiaks” (Let’s relish, or something like that). Marja Tyrni is singing finnish classic song: ”Matkalla Alabamaan” (”On the journey to Alabama”) with changed name and lyrics. Mr.Mallorca (Jussi Vatanen) came second in 2011. This is one of my favorite characters. He’s travel guide. He greeted every one like this: ”Buenos tardesta vaan kaikille” (Buenos tardes(ta) to all of you). Slogans: ”Saletisti natsaa” (It nails for sure or it bites for sure, also it can mean ”get laid”), ”Se on ihan let’s go!” (It’s totally let’s go! (Don’t ask)). The third winner: Leena Hefner o.s Herppeenluoma (Armi Toivanen). She is from Florida and she have made charity. Her hobby is disco. Leena always told stories how she was ”awfully awfully drunk”. Slogans: ”Minä tiesin” (I knew it), ”Mittää en tarvihe” (I don’t need anything). Winner 2013: Karim Z.Yskowitcz (Jussi Vatanen), 45 years old immigration critical rightist who speaks finnish with foreigner accent. In 2014 they showed us two Putous: at spring time and at fall time. Winner 2014 spring was one of the best characters: Antsku (Jussi Vatanen, (again)). Antsku is shy country”girl” from Imatra: Mansikkala. She have a jealous man. Antsku had a great stories and sympathetic personality. Slogan: ”Mie romahan” (I flop). Also She did start her sentences often liike: ”Hitoksee…” (”hitto” is like shoot so this could be shooting or something). In the first video Antsku is telling how she decided in the morning to come to Helsinki cause her ”Ukko” were all night away from home. He went at hockey game and didn’t come home after that. ”She” thinks that he have something with some other girl. Her best friend Maikku did encourage her to leave. At the end the host: Jaakko try to hug her but Antsku don’t want him to hug. ”She” says that if her ”Ukko” see it, she will flop. Winner fall 2014: ”Liitto-orava”, Salme Pasi (Union-squirrel as Joonas Nordman). (In finnish ”liito” means glide and flying-squirrel we say: glide-squirrel. ”Liitto” means: union so the name comes those mix. This squirrel is in Ay-league which is a trade Union). This was also great character! Slogans: ”Pehmeet touhuu” (smooth hustle), ”Sillai kai” (thus maybe-it’s Turku dialect). Women he calls the name: ”Soiva peli” (pealing game). This was the most hardest competitior for ”Liitto-orava”: Kissi Vähähiilari (Antti Holma). ”She” was the most popular at first but at the end Pasi cuted over and Kissi came second. Both were great! Kissi is some kind of fitness sports woman and ”she” have always different kind of ”diets”. Those are not normal diets, rather for example meet diets, not salad or anything light including. Slogans: ”Mä oon niin tööt” (I’m so toot/”tired”). Also she have different phrases like: ”Jaksaa jaksaa, painaa painaa, elämä on lainaa, kohta oot vainaa.” (Manage manage, push push, life is a loan, soon you are late). This is free dance performance from Kissi’s competition program. It’s great! Watch this! Winner 2015: Matti Pikkuvanhanen (Joonas Nordman). He’s 9-year old politician and wiseguy. He likes to be valid and hate to play like children. Slogan: ”Heikki, Heikki, kato mua, kato mua.” (Heikki (host), watch me, watch me). This is my favorite entertainment tv-program which is finnish format. That show has been performed every year (exept 2016) since 2010. It includes improvisation, different sketches and sketch character competition. Every actor create an own sketch character and in every period one of these characters is dropped out. In the end of the seasion one of those characters will be the winner. Last evening did resolve the new winner: ”Aina Inkeri Ankeinen” (as Pilvi Hämäläinen). She did parodise bitter people. She’s mantra (which you hear in third video) is: ”Oi luoja ota minut jo pois täältä” (=Oh, good please take me away from here). Also she did often said: ”Hiljaa” (quiet) to the host: Roope Salminen. My own favorite character was the second runner-up: ”Abdul Tuisku” (as Ernest Lawson (in that first video-clip)) which was partly parodised of finnish pop-singer: Antti Tuisku. Also I liked the fourth runner-up: ”Amurin Enkeli” (as Jenni Kokander) who was the love ambassador: the amor; like an angel of amor (in the second clip). She said she have joined together for example our president: Sauli Niinistö and his wife: Jenni Haukio. In this sketch actors did change their characters themselves (so they did perform each other characters). It was not so easy to everyone as you can see. For your information, ”tuomio” (judgment) is the nomination of person who will act in the ”näytön paikka” (show time) which is all about improvisation of changing subjects and styles. The actors wote that person. One person always got the immunity who can’t be woted. That immunity is solved in ”Tulikoe” (crucible). In this clip immunity is given to Timo (that one who gets the big hat). Describe your dream woman. (embarassed answer with mentioning of breasts). Do you want to ask something? (You can see the answer). Do you remember this ice cream? If you’r finnish and over 20 I think you do! Now those are coming back (or atleast two of it’s tastes: liquorice and schocolate). I loved that ice cream when I was a child and it’s great to have it back! Super ice cream advertisements were also funny (as you can see in these videos). Dancer (the teacher): Mikko Ahti and singer: Maria Lund. Winners 2008. Dancer: Ansku Bergström and finnish pop Star: Antti Tuisku. Winners 2010. Dancer: Matti Puro with miss Finland 2010: Viivi Pumpanen. Winners 2011. Ansku and (duudson) Jarppi 2011 paso-doble. They came second. Dancer: Matti Puro with comedian: Krisse Salminen. Winners 2012. Chalston 2014: Janna and Matti, Cristal and Kia and Kaj and Susa.